How Far is BBCL Navarathina? BBCL Navarathina, a residential project located in Ambattur, developed by BBCL. A home so precious. Come and be a part of BBCL Navarathina and enjoy the precious life. A home is a place where you can enjoy your life peacefully and you can live cherishable moments when it is an own home it adds the extra charm. This project offers apartments for sale in Ambattur, here you will come across 1BHK,2BHK and 3BHK apartments, the size of 1BHK apartments is 624 Sq ft, 632 Sq ft. 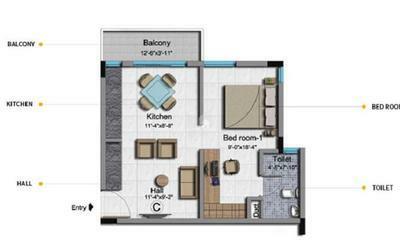 The size of 2BHK apartments is 998 Sq ft,1187 Sq ft. The size of 3BHK apartments is 1295 Sq ft, 1528 Sq ft.
BBCL Navarathina is located in Ambattur at Chennai. This project is located in one of the best locality which offers many benefits to the occupants. Calm, peaceful and soothing place. A peaceful place where you can enjoy your life to the fullest. Come and experience the tranquility at BBCL Navarathina. This home offers a peaceful living to the occupants. Built with best in class materials and fittings. High quality, comfort, elegance, and tranquility are the few words which can explain the BBCL Navarathina. Navarathina is an IGBC Pre-certified Gold Rated Green Building. The well-laid floor plan at BBCL Navarathina allows the home to welcome abundant natural light and fresh air. Along with apartments in Chennai BBCL Navarathina offers an array of amenities some of them are Children's Play Area, Multi-purpose Hall, Clubhouse, Yoga/Meditation Hall, Indoor Games, and basic amenities. (Johnson / Asian or equivalent). · Anti-skid ceramic tiles for toilets and utility area (Johnson / Asian paints or equivalent). · Glazed ceramic tiles for toilet wall and utility walls (Johnson / Asian paints or equivalent)upto 5'0" ht. · 4" high skirting matching the floor tile as per design. DOORS & WINDOWS · Main door: Teakwood frame with designer solid shutters duly polished /painted as per design. · Interior doors: Flush doors duly treated and painted. · Toilet doors: Flush doors laminated on one side and PU coat on other side. · Godrej or equivalent locks and tower bolts for all doors. · Windows - Fenesta or equivalent make UPVC windows. · 4mm clear glass panels from Saint-Gobain/Modiguard or equivalent for windows. · Powder coated MS grill for all windows as per design. KITCHEN / UTILITY · 2" thick Granite kitchen platform with edge nosing. · Glazed decorative ceramic tile(Johnson or equivalent) in kitchen for a height of 2' above platform. · Single bowl stainless steel sinks in kitchen & utility(Nirali or equivalent). · Sufficient 15 amp& 5 amp socket provision for chimney, hob & other kitchen appliances. · Individual RO system for Drinking water. · Glazed ceramic tiles (Johnson or equivalent) in utility upto 5'0"ht. · Provision for washing machine in utility. ELECTRICAL · Finolex or equivalent make copper wiring in PVC concealed conduits . · Modular plate switches (Philips or equivalent). · Automatic phase changeover switches (Philips or equivalent). · Ready to use AC conduits in all bedrooms. ELEVATORS · Suitable passenger elevators from companies of high repute(Johnson or equivalent) with sufficient power backup. WATER SUPPLY / PLUMBING & SANITARY · ISI certified concealed CPVC lines for water supply and UPVC sewer lines. · Superior quality wall mounted EWC (Roca or equivalent) in all toilets. · Superior quality washbasins in all bathrooms (Roca or equivalent). · Good quality CP fittings (Roca or equivalent) in toilets, utility & kitchen. · False ceiling in all toilets. · Hot & Cold water mixer unit (Roca or equivalent) in all toilets. SECURITY SYSTEM · Access control at entry level. · Intercom facility. · Video door phone system. GREEN FEATURES · Adequate day lighting and fresh air. · 100% of the waste water generated on-site is treated and reused within the site itself for landscaping, flushing and other custodial purposes. · 100% solar hot water. · 100% Rainwater harvesting and use of Ultra Low flow fixtures. · Use of Eco friendly Building materials. · Landscaping with native Species. · Water meters and energy meters.